If you're a do it all, super parent you know the struggles of trying to transport your kids' toys and day to day necessities around at the beach or at a sporting event. For all those non parents, you still know the difficulty of hauling groceries from the car to your home. No matter the scenario, this utility cart can handle it. From toys, to groceries, to everything in between, go with the Seina Compact Folding Outdoor Utility Cart and lighten your load. 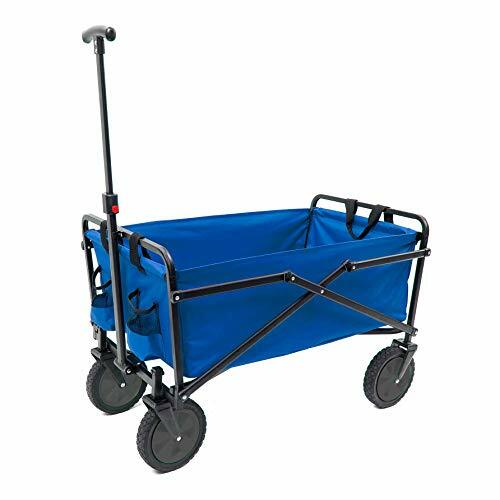 Constructed with a heavy duty steel frame and durable 600D polyester fabric, this cart will hold up no matter what job you throw at it. Unlike other copycat carts, this one fold compactly and stores easily in your trunk, garage, or closet, ensuring easy transport. Plus, the best part is it takes only seconds to set up and use. Lighten up your load and utilize this versatile cart for your everyday needs. Weight Capacity of 150 lbs; Open Dimension: 32.66" x 19.67" x 20.07"; Folded Dimension: 29.50" x 19.67" x 6.89"